In one of the most spectacular series so far, the Koreans fought fire with fire, matching and surpassing Empire's appetite for full on aggressive DotA. 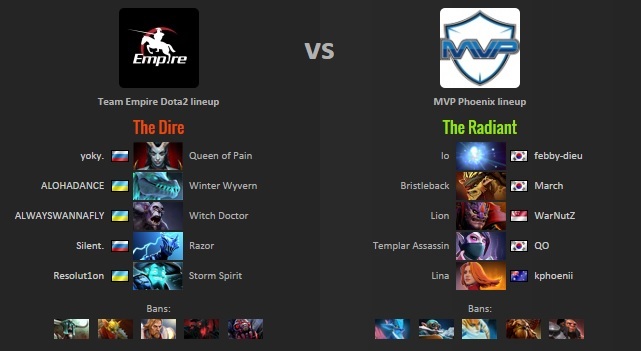 For the first game of the series MVP.Phoenix chose to draft a teamfight oriented lineup with a Bristleback – Io combo and a Templar Assassin for QO but got completely dominated by Empire in the early stage. The CIS aggressiveness was fully represented by Team Empire who focused to shut down the March – febby duo and lost QO’s Templar Assassin from sight. And although they were in a huge lead, Empire managed to lose a teamfight 15 minutes into the game, tamfight in which febby used his buy back and that seemed to be the point where MVP.Phoenix made the comeback as QO got a mega kill streak. From there on MvP.Phoenix kept the momentum going and with a spectacular performance from QO they simply destroyed Empire, winning the first game and gaining a huge boost of morale goind int o the second one. MVP.Phoenix have shown a lot of confidence in QO’s personal skills as they were not afraid to draft a last pick Lina for him to face Resolutt1on’s Templar Assassin in mid lane. Having a carry Phantom Lancer for kpii to race head to head with Silent’s Anti- Mage in terms of farm, MVP.Phoenix went full aggressive using a lot of rotations all over the map, beating Empire at their own game. The Spirit Breaker – Bounty Hunter duo was used by the Koreans at its maximum potential and not even Silent was feeling safe anywhere he tried to farm, getting killed few times. When it came to teamfights it was Nutz's turn to shine on his Witch Docto , with perfect positioning he was able to almost fully cast his ultimate and sustain his team with heals. Although Empire managed to win two important teamfights due to yoky’s Tomb Stone, one of them being in the Roshan Pit, MvP didn’t stop the aggression and returned grouped as five to take Empire‘s base. 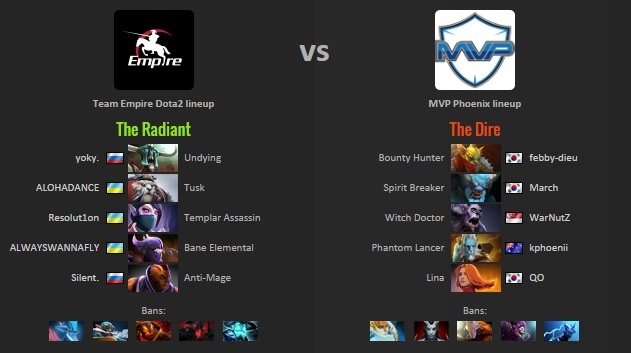 And after two insane teamfights MvP.Phoenix emerged victorious and eliminated Empire from The International 5.